In its preliminary report of 2018 state spending data, the National Association of State Budget Officers (NASBO) predicts that Wyoming keeps its outlays flat. The upside with the NASBO state expenditure report is that it gives us an early idea of trends in spending; they have already published estimates of spending numbers for the 2018 fiscal year. They also break down federal funds by the programs they track, including Medicaid. With that in mind, we can extract some interesting factoids from this year's report. It is worth noting that this report not only gives us a heads-up about 2018 spending, but also revised, final numbers for 2017. The changes there are minor, especially for Wyoming, but on occasion there can be substantial revisions, especially in the program-specific data. We will get to that level in a later piece; for now, let us review the total spending numbers in Wyoming, and in other states for comparison. At 4.7 percent, the increase in total spending by all states was the highest since 2015. 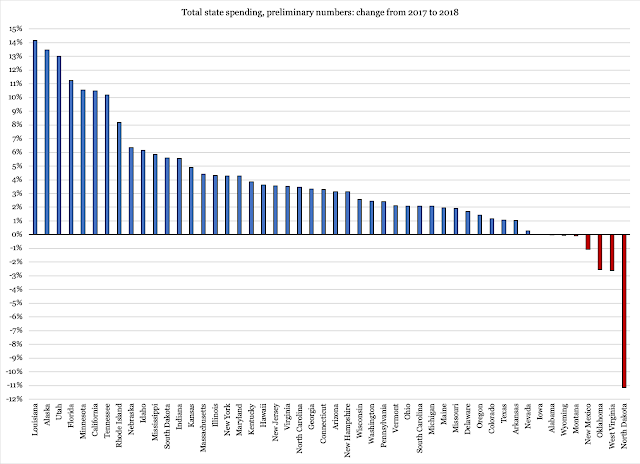 It is not dramatic, though as Figure 1 explains there were seven states where spending went up by double digits. 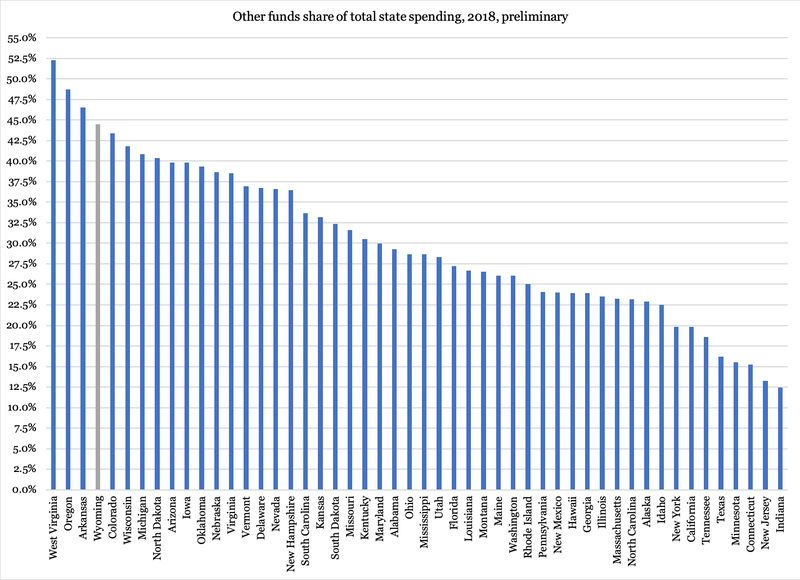 By contrast, in eight states total spending stood still - Wyoming - or declined. This is, of course, welcome but it is also not a sign of some sprawling trend of fiscal conservatism. In 2017, eleven states froze or cut total spending, while Illinois led the spending league with a 25.1 percent growth in one single year. Montana came in second at nine percent. In 2015, eight states grew spending by more than ten percent, six of them above 15 percent. Wyoming came in fourth at 17.1 percent. 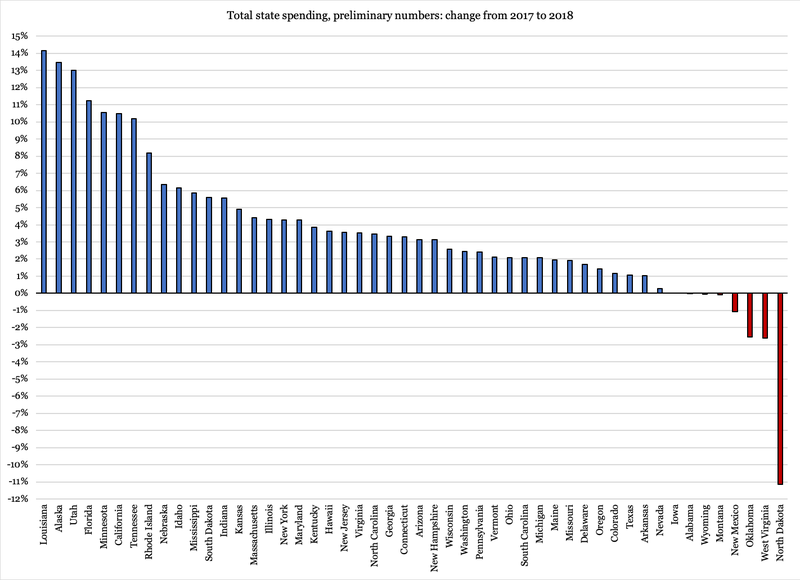 That year, three states - South Dakota, Maine and South Carolina - made significant cuts to total spending. If we go back to 2013, Wyoming led the expansion by 58.8 percent, followed by Oregon at 51.9 percent. These sound like ridiculous numbers - and they are - but it is worth remembering that the Wyoming number reflects a dramatic rise in state-funded construction. In other words, it is important not to take one single year as evidence of a trend. It is only when placed in a context that a one-year set of observations can make sense. 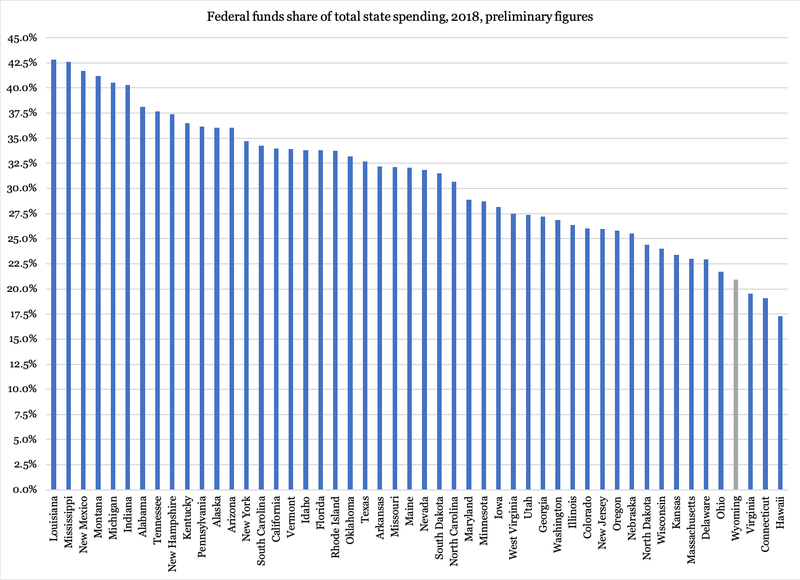 Federal funds are another key indicator of where state spending is heading. 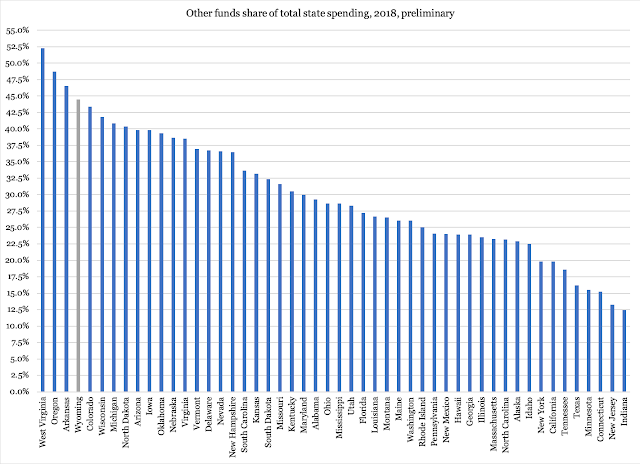 The dependency on federal funds gives us an indication of how much fiscal independence a state has; to get a full picture we need to know how much the states are spending in matching funds to maintain the inflow of federal money. The problem with Wyoming numbers is that they do or do not include severance taxes collected for us by the federal government. In data provided by federal agencies - primarily the Census Bureau - that severance-tax money is added to the $925 million that NASBO reports we got from the federal government. If we count our federal-funds dependency according to the federal definition, we would easily end up in the top-ten in Figure 2. Another variable to keep in mind is Medicaid Expansion. Standard NASBO data does not allow for the discrimination of regular Medicaid funds from Expansion funds, but since the expansion is initially paid for almost entirely with federal funds, Wyoming would quickly move into the mainstream of federal-funds dependency if we accepted Medicaid Expansion. Even more problematic is the fact that Wyoming has been increasing its Other Funds share in recent years. This is a trend that raises questions not only about transparency - serious enough as it is - but also about spending control per se. By default, Other Funds spending is supposed to be paid for with fees and charges that are specific to the activity behind the spending; the fees we all pay for renewing our driver licenses is supposed to fund the administration of them. In practice, though, states have moved away from this principle, thus de facto blurring the line between the General Fund and Other Funds. That is all for now. Coming articles will address program-specific spending in the NASBO report.